To the extent many would pay for courses to learn these techniques. Almost in every Date selection course, masters will use them even in some Feng Shui Courses. They also use these in their yearly events, conferences or talks to advice dates to start work, start a diet, to start renovation etc. The results they yield is mostly in consistent. If you can read Chinese, you may read what is written on the pages of Tong Shu or Chinese Almanac. 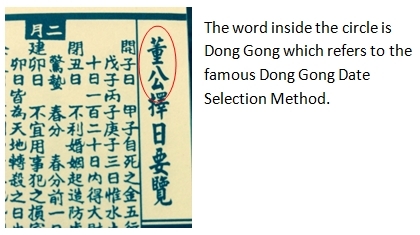 As you may see, it clearly states that method available in the Tong Shu is the lowest form of date selection method but it exist till today due to the fact that this method has been part of Chinese Culture and hence they carry on the publication. I commend them for their honesty to inform readers of the reality and truth. You maybe curious by now what method is found inside the Tong Shu then? Here you go…. 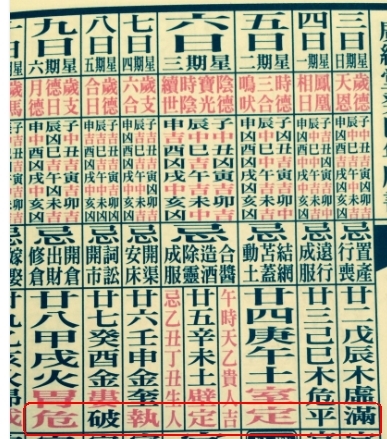 Note: the Dong Gong method encompasses the 12Officer selection method of selecting days based on Open Day, Close Days, Remove Days, Success Days, Establish Days, Full Days as you may see below in red circle etc. Next is the 28 Constellation Stars that goes with each Jia Zi Day. These methods are purely for entertainment purposes. Getting results or not is mostly a matter of coincidence or the effects of the Law of Attraction. Read on this in my other posting on Personal Feng Shui, if you like to know more about the Law of Attraction. Of course from the commercial point of view, this could be a good “product” for the school. Since inception in 1984, our school which is Central Academy of Feng Shui or in short CAFS, do not teach these methods but rather uses the correct and proper system of Xuan Kong Da Gua, which is why our system yields consistent results in Feng Shui audit. Just to let you know..there are many variants of Xuan Kong Da Gua, be informed! So readers, it is of no worries which day you wish to start work after the long celebration break, may it be a new year or summer holiday. You do not need to worry sick about which day and what hour to start work or start your diet or visit a doctor. In pure feng shui sense, these events are not significant as compared to move in date, ground breaking, tomb stone setting or even starting renovation. For these, we use other method mentioned above. Next postCase Study – South Facing An Inauspicious Facing? T220012014 thank AlanChong.! cám ơn anh ALANCHONG rất nhiều ^^..
Could you elaborate more in english the statement 為九流之一 (one of the extremely poor) in the preface.jpg so i could accept the arguments that Dong Gong and 29 Constellation Stars are the lowest form of date selection methods compare to Xuan Kong Da Gua. Thank you. You have already translated it.